A vegetation fire on Tuesday tore through steep terrain in the Santa Cruz Mountains, prompting evacuations and injuring five firefighters. The blaze, which ignited late Monday in the area of Bear Creek Road near Rons and Dons roads, had spread to 271 acres and was 5 percent contained late Tuesday night, according to Cal Fire Assistant Chief Rob Sherman. At least four unknown structures have been destroyed, but crews appeared to be gaining control of the flames. "I think we're making pretty good process," Sherman said, noting that the fire has not spread as much since sunrise. But Sherman also acknowleged resources are spread thin. He said he’ll need more boots on the ground Wednesday to relieve exhausted crews. "We put in a request for tomorrow for resources," he said. "We hear we’re going to get them. I don’t know if we’re going to get them all or some." The five injured firefighters, including an inmate firefighter, all suffered minor injuries while battling the blaze, according to Sherman. Injuries included a broken wrist, smoke inhalation, lacerations and a sprain. Evacuations were ordered for Deer Creek Road, Rons Road, Dons Road, Lost Valley Road, Favre Ridge and Oak Ridge, according to Cal Fire. Those orders involved about 150 homes. 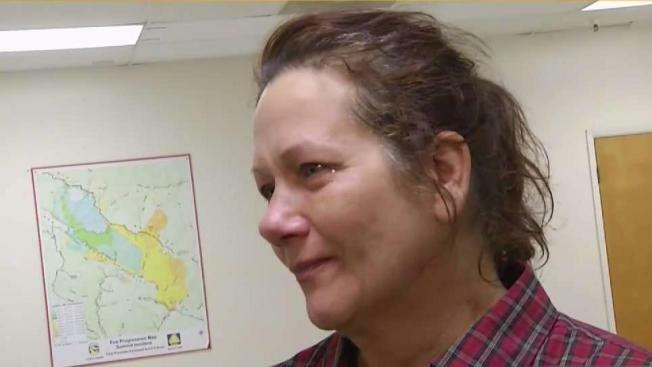 "About midnight, we looked out our window and we saw a wall, a literal wall of fire that was about to jump over the ridge that's fairly close to our house," evacuee Virginia Becker said. "We didn't need a phone call to say it was time to evacuate." Flames from a structure fire that broke out along Bear Creek Canyon sparked the blaze, according to Cal Fire. The fire was burning in the direction of the Las Cumbres area, but the flames were still roughly one-quarter mile away from that region around 10:30 p.m. Monday, Sherman said. "We dont have wind, so that's good," Sherman said, noting that low humidity is a concern. "It's really dry in the area." As of Tuesday evening, 600 firefighters, 52 engines, nine helicopters, five dozers and three air tankers had joined the assault on the blaze, according to Cal Fire. Aircrafts drop fire retardant near Lost Valley Road in the Santa Cruz Mountains as crews try to gain control of the Bear Fire. Garvin Thomas reports. 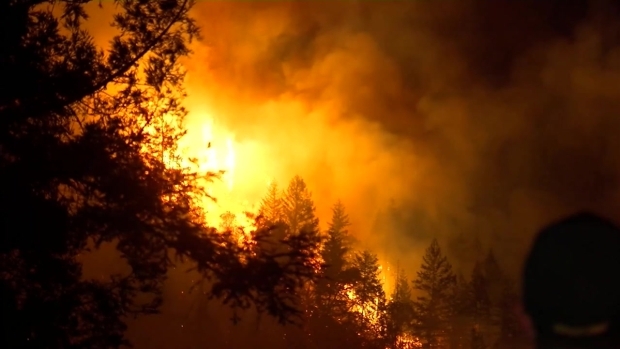 Before the sun rose, towering flames could be seen devouring trees as the blaze ripped through a hilly and heavily-forested area. The shooting flames died down by the mid-morning hours, but thick smoke continued to hover over the mountain range. "It looks like a volcano went off," Boulder Creek resident Grant Kappen said. Kappen has not been evacuated, but he said he is closely monitoring the flames. "With all the new news going on right now regarding all the fires, we're a little concerned," he said. Boulder Creek Elementary School closed for the day Tuesday as a result of the fire, according to the San Lorenzo Valley Unified School District.